Discussion in 'Benchmark Mayhem' started by BetA, Jun 11, 2014. Not shure if u guys wanna post your scores in teh Original 3dMark 13 Thread, or here..
if u wanna post here, i can make an list in teh First post if you all want..to see who has teh biggest *'*'*', haha..
First test shows only blackness. oh well. lets OC some more..lol..
All my tests work fine running W7 x64 SP1 with i5-2500K@4.5GHz and GTX 480@stock-reference 337.50beta (HQ). 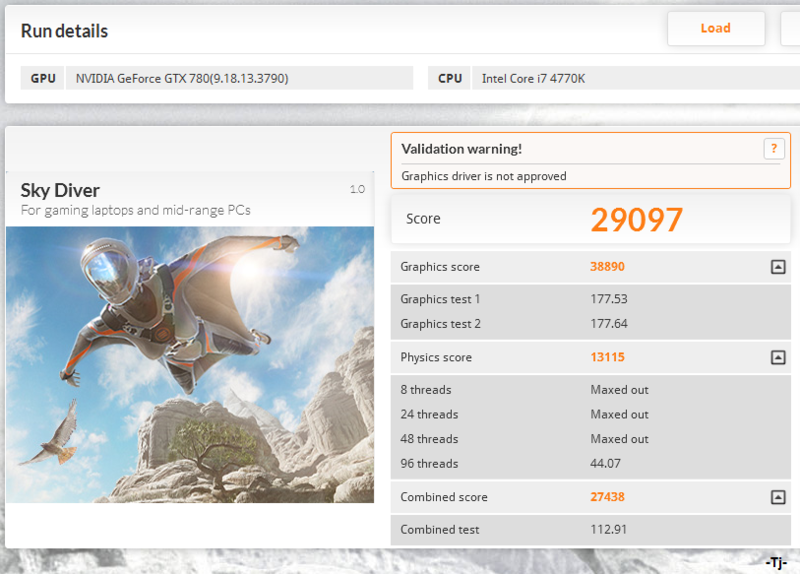 While testing the 3DMark Sky Diver benchmark, NVIDIA discovered an issue where some of their GPU configurations would render a black screen during benchmarking. NVIDIA has since solved the issue for these configurations and will be including the fix with their next driver installment coming early next week. In the interim, if you experience this issue with your configuration please use the 335.23 WHQL driver. 2560x1440p run: no complete score ( tell me that default setting have been modified ( resolution )..
All my tests work fine with W7 x64 + GTX 480@stock-reference 337.50beta (HQ). Still no problems after 337.88WHQL updated. If you have Windows 8.x then you may get black screen in 1st test. It's likely. Tried it with my OCed 7970 using Cat 14.6 and standard quality settings in the CCC. It did 32739 GPU. Good to know as I'm having this issue. I'm quite content to wait until the next driver set shows up. Thanks for the heads up Hilbert. Not necessarily a bug. It could be that it is cpu limited. 3930K @ Some frequency, my BIOS is f***ed at the minute and so I'm not sure how fast it's running. 32 GB DDR3 @ 1600 MHz, that bit I did get running. 2 x 7970 @ 1050/1500. I dont think, it is a combination of gpu and cpu, and it is multithreaded, ( a combination of the physic test and the graphic 2 test ). with a 6cores cpu at 4.3ghz, i dont think the cpu could really limit the graphic score..
We have got smiliar bug with Firestrike when it have been launched, after the physic test, cfx not scaling or is not enabled on combined test. http://www.3dmark.com/sd/2135170 High performance setting in NV control panel.